I have enjoyed these books, but as others have said, the narration is is not very good to the point of possible distraction. There are 3 sets of trilogies in this box set. So 3 stories in nine very small books (seriously, they could have and maybe should have just been 3 books total.) the first main problem I have with this set is that the order of the stories is wrong. I understand that there are other stories in the series but I thought, and hoped that the three that were chosen to go into a box set together would be in the proper order, and not have other stories that belong between them that are not included in the set. The first story that plays had good narriation and was an entertaining story with fun characters. 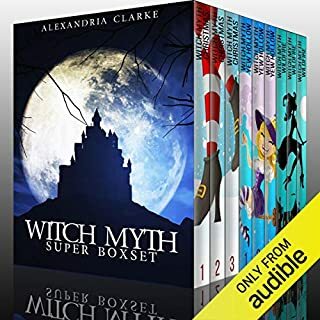 There were several things mentioned that sounded like there must be more to that story or situation that was just mentioned casually, so I figured that there are books outside of the box set that get into those. Then the second story starts, and wait! Why is there a British narrator in a story about someone who is fully American? Instead of a young American, this narriation sounds like it is a story based on a middle aged British lady. Oh well, I can get passed that without too much thought about it. But then I realize that this story takes place before the one that I just heard. Several things that were mentioned in the first story were actually pretty big spoilers about the second story. That’s a bummer, why would they put them in the wrong order? The third story was good, and was in the correct spot as far as these three stories are concerned. It is a bit distracting when the narriator doesn’t know how to pronounce so many common words. For example, pronouncing the L in salmon, or the A in cocoa. Also Salem was pronounced weird, and where it was pronounced incorrectly each time it was said, there were a few times when it was pronounced differently. So there were 2 incorrect pronunciations of the same word. So for anyone interested in the correct order of the stories, the second story comes first. Then there has to be at least one other story that is not included in the set, because of things that are mentioned in the other two stories. I haven’t gotten into other stories in the series to give a name of what should be in there. Then the first story should be played second, and the last one is in the correct spot. But it takes place several years after the first one, so I’d be surprised if there are not a couple of others that belong in that space. So, the stories themselves are entertaining and fun, but it would be nice if someone would put them in a proper box set where they are all together and in order. And some of the narriation could be quite a bit better.